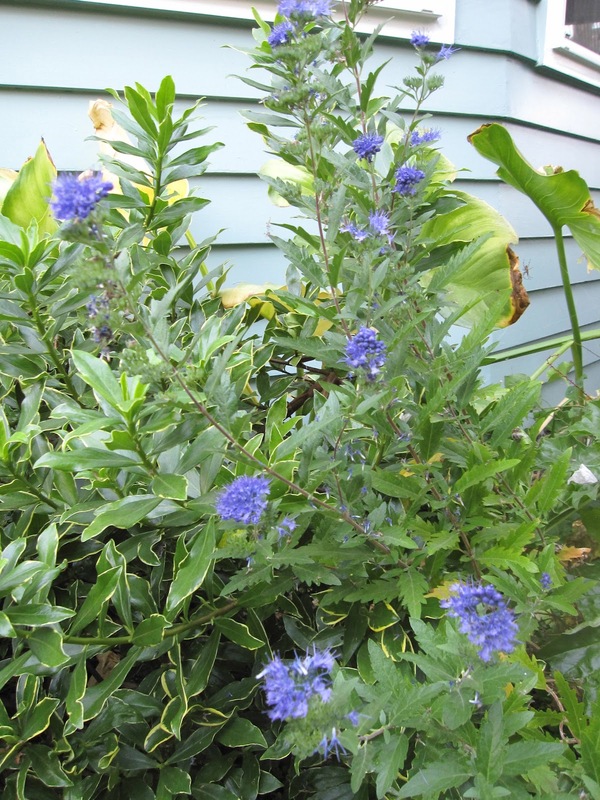 Caryopteris is a late-summmer bloomer with a hue reminiscent of one of my favorite garden plants, Ceanothus. The bees like it as much as they like Ceanothus, too. This is only part of the original plant. A couple of years ago I accidentally shoveled it apart when it was dormant, but I stuck the broken off piece in the soil and it came back the next year. Now I have two plants. Speaking of Ceanothus, C. 'Victoria" is showing a few blossoms this month, too. That may be the result of the small pruning it got following its spring bloom. 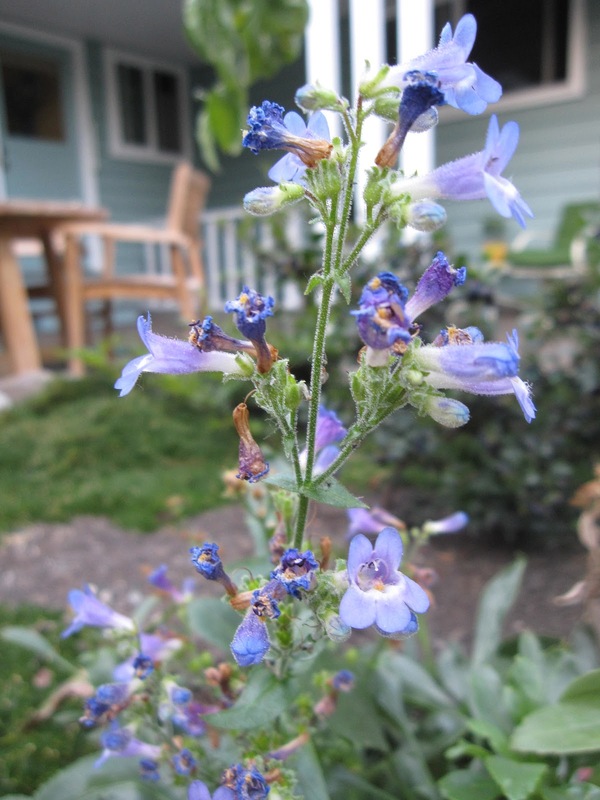 Also in blue this month, the indefatigable Fine-toothed Penstemon (Penstemon subserratus). This pretty NW native has been blooming off and on since May. The Mulchman is enjoying the color in his Northwest Territory, so I've been sprinkling its seeds around in hopes of volunteers next year. 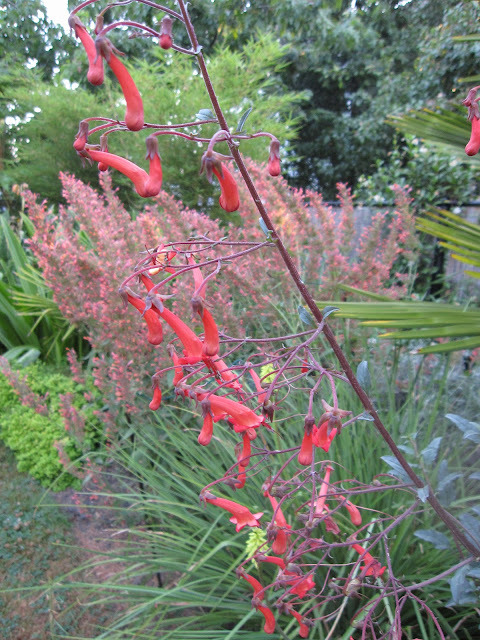 Another long-blooming plant is Agastache 'Acapulco Orange'. Its color seems pinker now at the end of summer, but it's been performing since June with absolutely no supplemental water. I love this plant! An encore performer is Phygelius x rectus 'Passionate'. I cut the spent bloom spikes off a month ago, and it came back with quite a few more. I'm glad, because the hummingbirds seem to particularly like its narrow orange tubes. 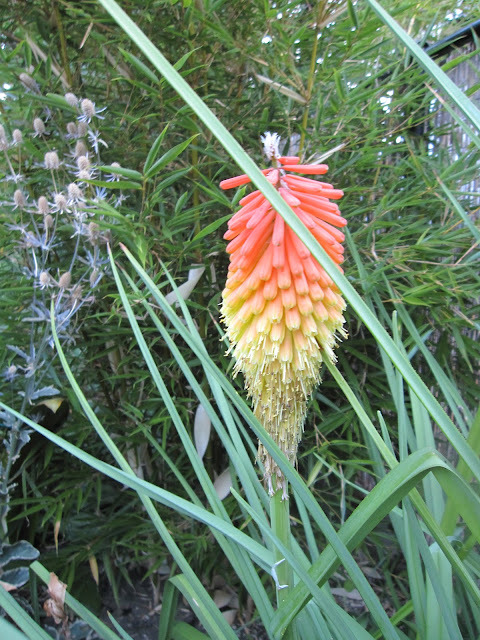 Kniphofia porphyrantha is giving us one welcome (but probably last) bloom. 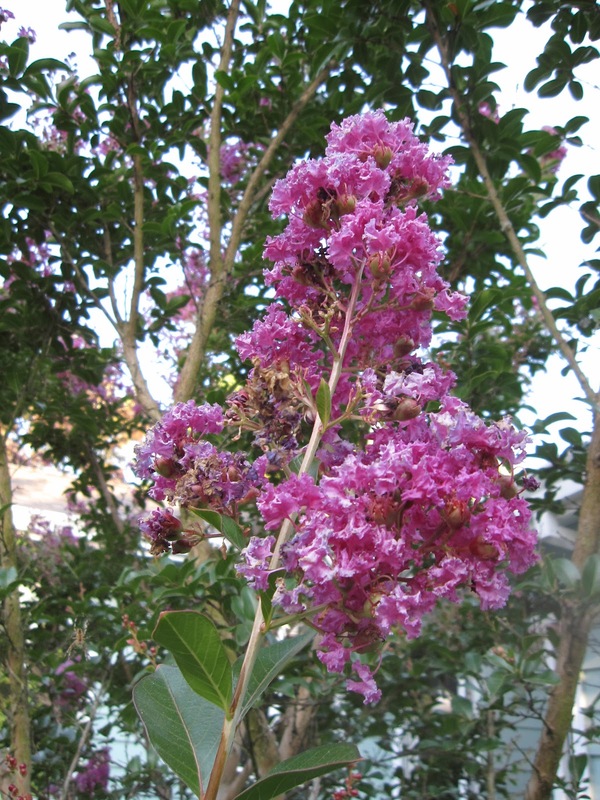 Our Crape Myrtle tree is in full flower. I don't know what cultivar it is, but from the color I'm guessing 'Catawba'. In more Crape Myrtle news, the much younger Lagerstroemia 'Natchez' has two bloom heads this year! I planted this cultivar for its reputedly striking bark, but the flowers are a fun addition this time of year. Trachelospermum jasminoides 'Confederate Cream' is still going strong. 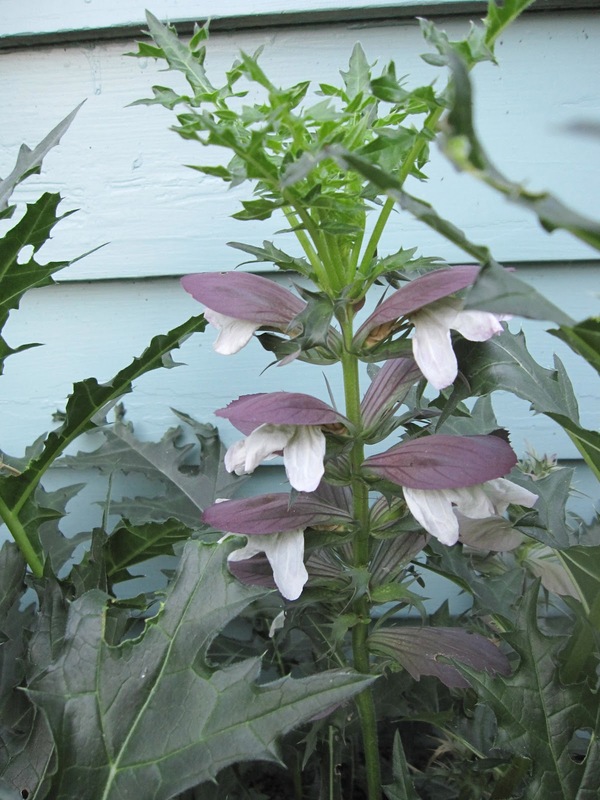 This long-lived single bloom on the Acanthus spinosa has sprouted a little topknot of leaves. Since it's new this year I have no idea whether this development is typical or a little strange. Common Snowberry (Symphoricarpus albus) is flowering, berrying and feeding bees. Finally, though most of the Crocosmia are finished, 'Golden Fleece' (also known as 'Citron') still has flowers for September. For more of what's blooming out there in the world this month, visit our host Carol, at May Dreams Gardens. Happy Bloom Day! This past weekend, my walking friends and I took a little hike...to an island. Most of the year, Elk Rock is a true island, but this time of year when the water is low there's a land bridge from the east side of the Willamette River across to the island. I had only stared at it from the Bishop's Close gardens on the west side of the river, and I assumed you had to have a boat to get there. Luckily, one of our party knew better. There was a surprising wealth of wildflowers in bloom where we crossed, maybe because the land is wet so much of the year there. This is Pennyroyal (Mentha pulegium). The small leaves looked like thyme, but their spicy, pungent scent was mint on steroids. 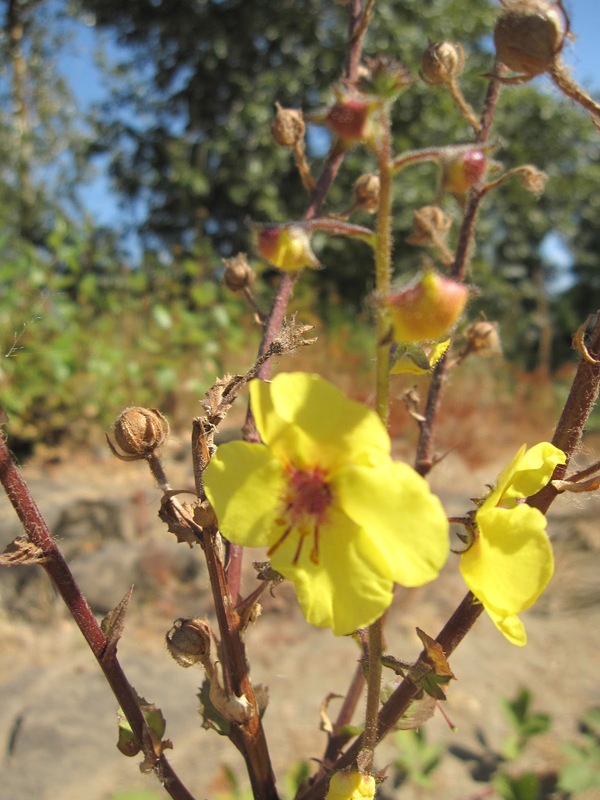 Oenothera - Evening Primrose. There were lots of tall stalks of these beautiful flowers. They seemed unfazed by the aphids all over their stems. The ubiquitous Queen Anne's Lace. A few ripening blackberries looked almost ready. The large daisies might not be true wildflowers, but they appeared to have naturalized. ...and a wonderful view downriver from the top of the rock. The US Geodetic Survey has been here - at least twice. It was the perfect place to bask in the early-September sun. More Oenothera and Yarrow Tansy (thank you, Grace) on the way back across. Last, here's a pretty flower I couldn't find in my wildflower book. It looks a little like a verbascum. Anyone know what it is? There's some Portland history associated with this place. If you're interested in knowing more, here's a link to Portland Parks & Recreation's Elk Rock Island page. Join us in a different city each year, to meet other garden bloggers and visit gorgeous local gardens! I'm Flinging in Denver, CO, June 13-16, 2019! Living on the edge, I practice zonal denial without a greenhouse. Simple forms, bright colors, tropical foliage, and anything in the Manzanita family will make me happy. Which house color looks best with foliage? Copyright 2012. Reprint only with express permission. Simple theme. Powered by Blogger.